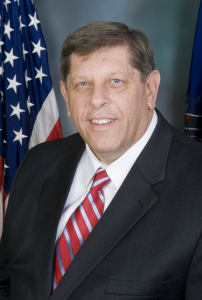 State Rep. Randy Vulakovich will likely soon be State Senator Randy Vulakovich. GOP party leaders named him as their candidate for the seat of ex-Senator Jane Orie, who was convicted over ethics violations earlier this year. The Republican is a favorite in the forthcoming special election. Vulakovich spent 27 years on the Shaler police force before winning election to the state House in 2006. “Right now, my focus is on winning and bringing some normalcy back to the 40th District. Later, I can focus on the new Senatorial District. That’s my intention,” he told the Tribune Review. At a meeting of Allegheny and Butler County Republican conferees Saturday, the Shaler lawmaker defeated former Congresswoman Melissa Hart (who was also Orie’s predecessor in the PA Senate). The numerous candidates dwindled until the fourth round of voting, when Vulakovich defeated Hart 48 votes to 33. He’ll face Democrat Dr. Sharon Brown, an epidemiologist who challenged Mike Turzai in 2010, in the August 7 special election. A key shift in the insider campaign came when the Legislative Reapportionment Commission drafted a new state senate map. With the aim of accommodating both candidates for the 37th district, Raja and Greg Parks, the LRC created a new district which includes most of the GOP-leaning North Hills plus Democratic Sen. Jim Ferlo’s Pittsburgh-area home. The newly labeled 38th district contains much of the same population center as the current Orie 40th district seat. All of a sudden, Republicans had a seat that could stay in their hands through 2014 – the next time it goes to the ballot. By the numbers, the district will favor the GOP challenger to Ferlo. That’s when Vukalovich tossed his hat in the ring, and Hart’s advantage dissolved. The change also doomed Brown indirectly; she has a difficult case to make to potential campaign donors. Her Wexford home is now in Ferlo’s 38th district, meaning that Dems’ best-case scenario in the special is to add a new Senator in 2012 who they would almost certainly ask to step aside for the 2014 primary. Thank God, Missy got the boot again. Being condescending, nasty, snooty, arrogant and just plain mean is not a winning combination. At least people are finally seeing they can do without the strong-arm tactics of Jim Roddy and Bob Asher, and are finally waking up to the disaster that is Tom Corbett. Hart is cut from the same cloth. Good riddance. See ya, Missy! Jim Roddey and Heather Heidelbaugh both supported Melissa Hart! I guess Jim took some time out of his busy schedule of attacking Republican County Council members to support Melissa in a LOOSING CAUSE! More political patronage as that is what Jim lives for, remember he served the Democrats for many years as he guided PAT into the financial ruin. Well, Turzi can’t pass anything in the House so he might as well have a stooge in the Senate for two years. Amazing. There wasn’t an Orie left who was not incarcerated? How many elections does Missy have to lose before she gets the message?…Hey Missy, why the long face? Which candidate had the backing of SRCC and state committee? Who did Jim Roddey support? Any early speculation about who would run for Vulakovich’s house seat? THANK YOU Allegheny and Butler County Republican conferees for putting Melissa Hart out to pasture AGAIN!! You choose the best candidate in Randy Vulakovich!!! !